• Desktop 3rd Generation Intel® Core™ processor family. The processor contains one or more PCI devices within a single physical component. The configuration registers for these devices are mapped as devices residing on the PCI Bus assigned for the processor socket. This document describes the configuration space registers or ...device-specific control and status registers (CSRs) only. This document does not include Model Specific Registers (MSRs). 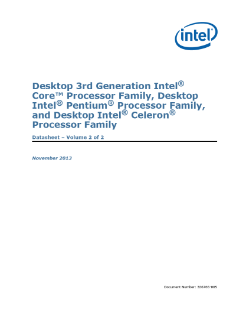 Read the full Desktop 3rd Gen Intel® Core™ Processor Family Datasheet, Vol. 2.